$19.95 and $8 shipping and handling. Fiscal sponsorship enables a nonexempt charitable project to raise funds and operate through an exempt sponsor that manages the project’s money and reports to funders and tax agencies. Many other administrative services can be provided as well. 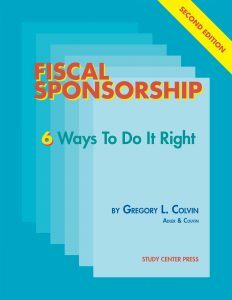 Fiscal Sponsorship: 6 Ways to Do It Right describes models of sponsorship that have been approved and accepted by the IRS. It details how the models work and why, how they differ and how they are similar. Fiscal sponsorship is a term that is not well understood even within the nonprofit world. Until Colvin’s book in 1993, “fiscal sponsor” was widely, and mistakenly, called “fiscal agent,” which misstates the relationship among a donor, a tax-exempt fiduciary organization and any separate nonexempt project under its sponsorship. Four leading San Francisco fiscal sponsors in the arts and human services (Intersection for the Arts, the San Francisco Study Center, Film Arts Foundation and California Lawyers for the Arts) began meeting in 1991 to collect and share information on sponsorship practices to clarify their legal underpinnings and improve their effectiveness. The meetings and the production of this book were supported by The San Francisco Foundation and The Wallace Alexander Gerbode Foundation. Study Center edited, published and distributed the book. Fiscal sponsorship is an ideal way for nonprofits to operate. It saves money, conserves resources, reduces duplication of personnel, simplifies organizational needs and offers other benefits to service-minded community groups. Nonprofits can utilize fiscal sponsorship to increase service capacity. Foundations that support fiscal sponsorship stretch their grantmaking, and for public agencies it is an efficient way to contract out services. Gregory L. Colvin is an attorney with Adler & Colvin, a San Francisco law firm specializing in nonprofit law. Two other books by Colvin (Seize the Initiative and The Rules of the Game: An Election Year Legal Guide for Nonprofit Organizations) are available from the Alliance for Justice.